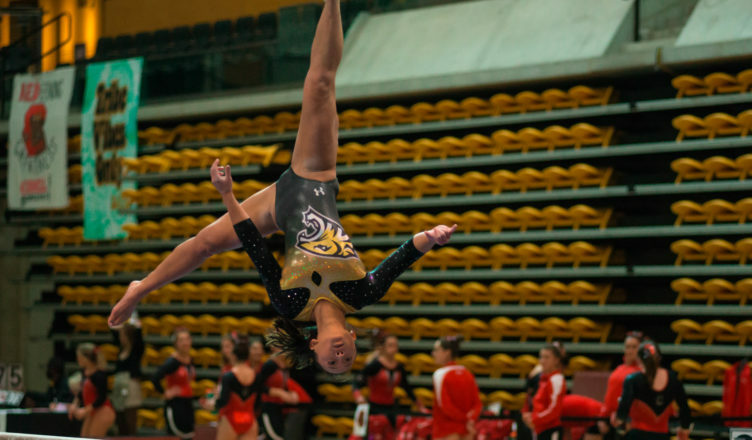 The Tigers started their 2019 season with a third place finish Friday night at SECU Arena. Towson competed against William & Mary, North Carolina State, and Cornell. The squad started off on the vault and scored a 47.750 after the rotation. The next event for the Tigers was the bars, where they placed an added score of 96.125. The third event was the balance beam, which is where the Tigers took a few stumbles but were able to keep their focus until the meets end. After an exemplary floor exercise routine, Towson received a final score of 191.950. N.C. State scored a 194.600, William & Mary had a 192.625 and Cornell placed last with a score of 191.450. Head Coach Vicki May was proud of her team’s performance to kick off the season, considering the team’s youth and limited experience. “Over 60 percent of our routines are brand new,” May said. May added that she expects the team’s confidence to grow throughout the season as the Tigers continue to add routines into their lineup. Next, the Tigers face off against West Chester University on Feb. 3. Game time at SECU Arena is slated for 2 p.m.